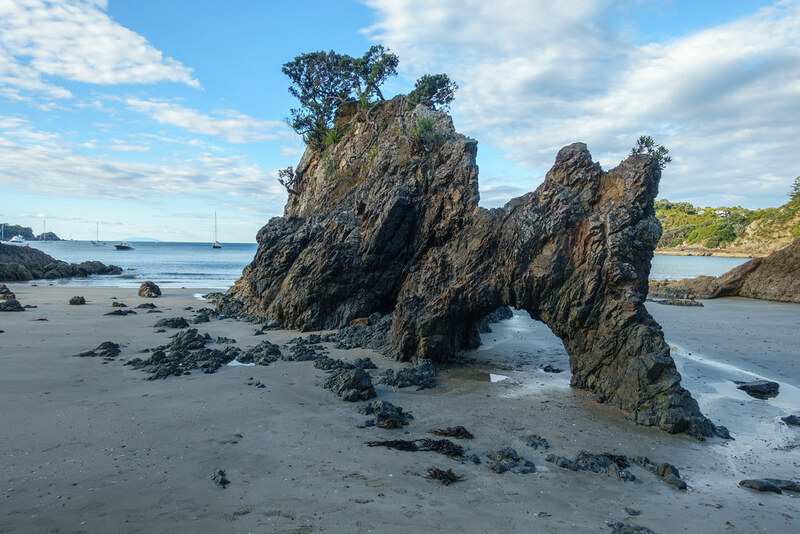 This is the second of a series of posts detailing mine and my sister’s trip to New Zealand’s North Island. View all the posts so far here. 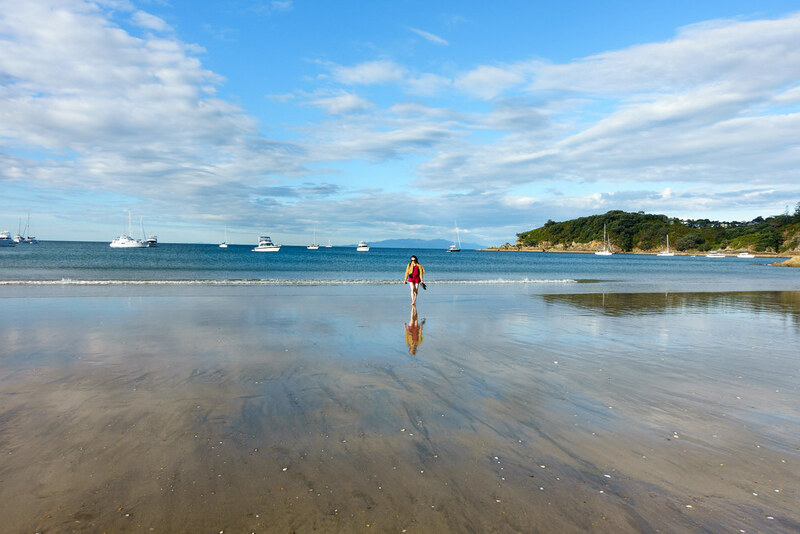 I’d heard that Waiheke Island, just a 40-minute ferry ride from Auckland, was beautiful. 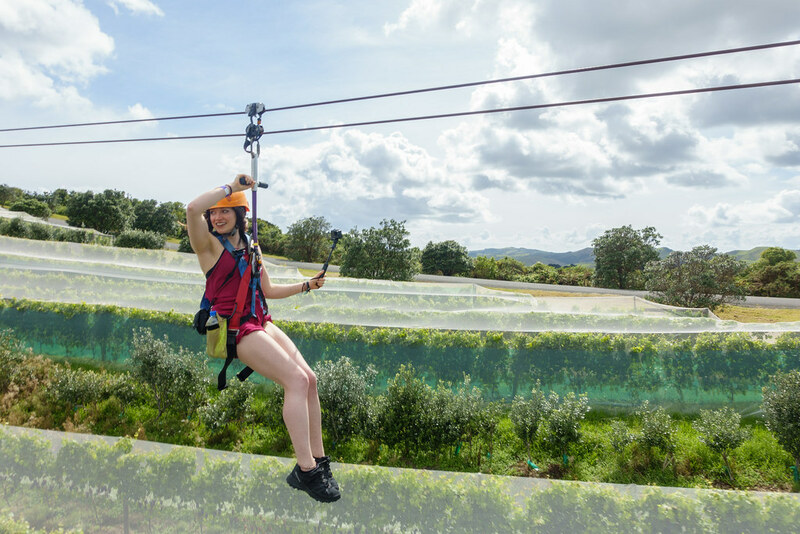 When I read that it also has three ziplines and 22 vineyards, I was sold. 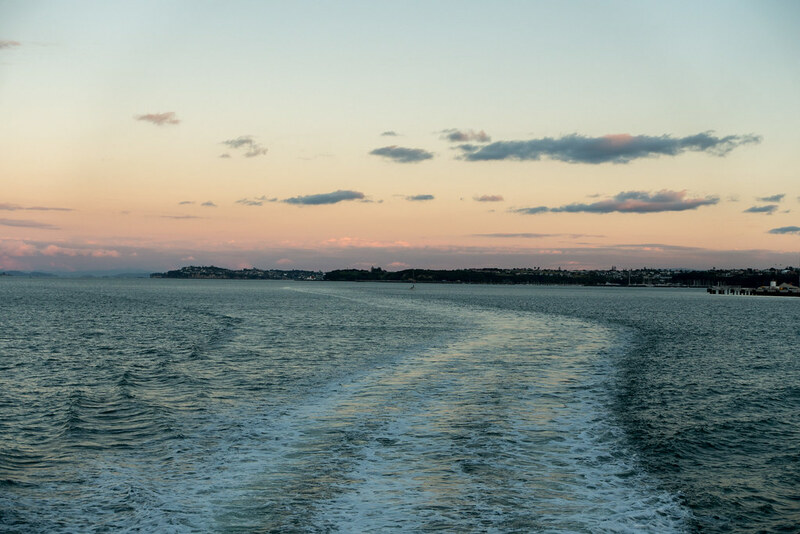 Lush scenery, thrilling fun and excellent food and wine – what more could you want from a daytrip? My sister Tama and I enjoyed the free breakfast at Queen Street Backpackers before walking to the ferry port to pick up our tickets. 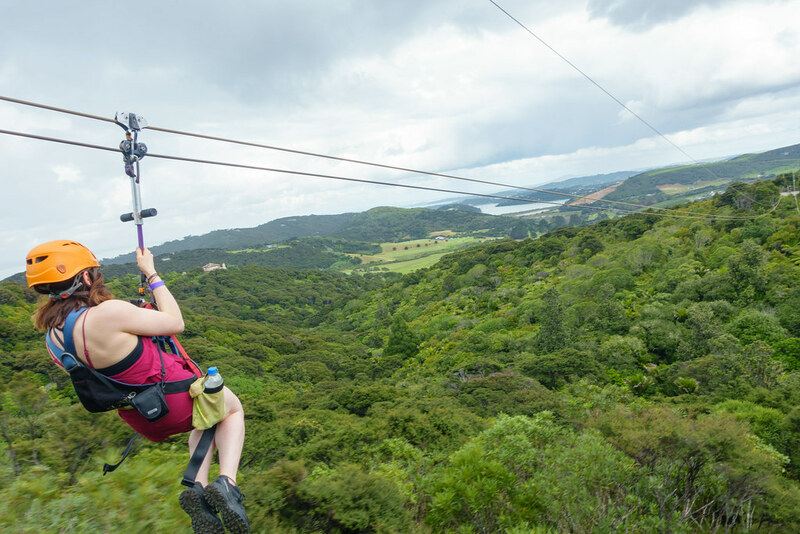 We’d made a booking with Ecozip Adventures to do their three flying fox ziplines ($119), and this included our Fullers ferry tickets and pick-up from Waiheke Island ferry port. 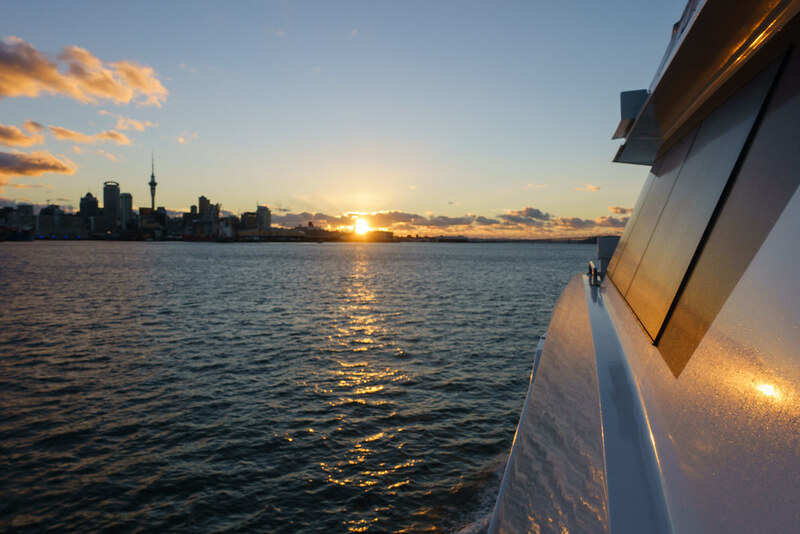 The cruise to Waiheke across the Tamaki Strait was a treat in itself: I stood out the back for most of the journey, the sea-spray and wind buffeting my face as I drank in the view of Auckland’s skyscrapers and the water shining in the sun. 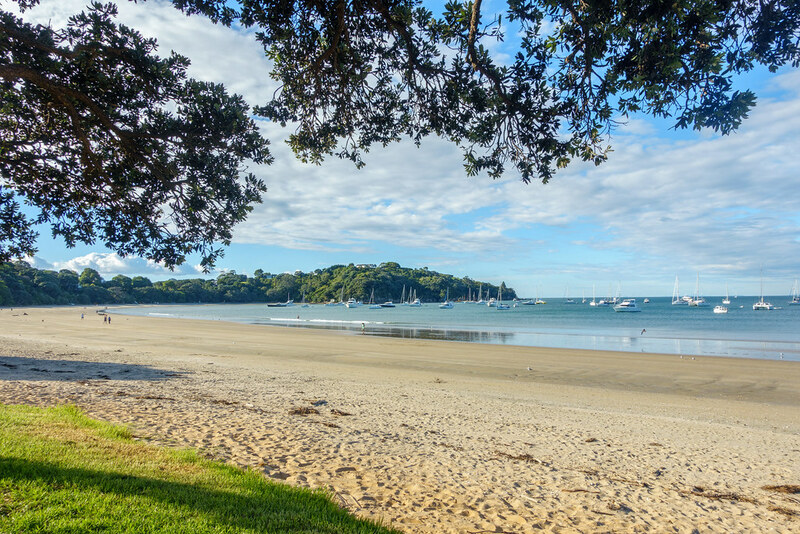 After a few minutes’ wait at Waiheke ferry port we were met by a woman from Ecozip, who drove us and the six others booked onto the experience to Ecozip headquarters. Here we met our two bouncy male guides and were strapped into our safety harnesses. 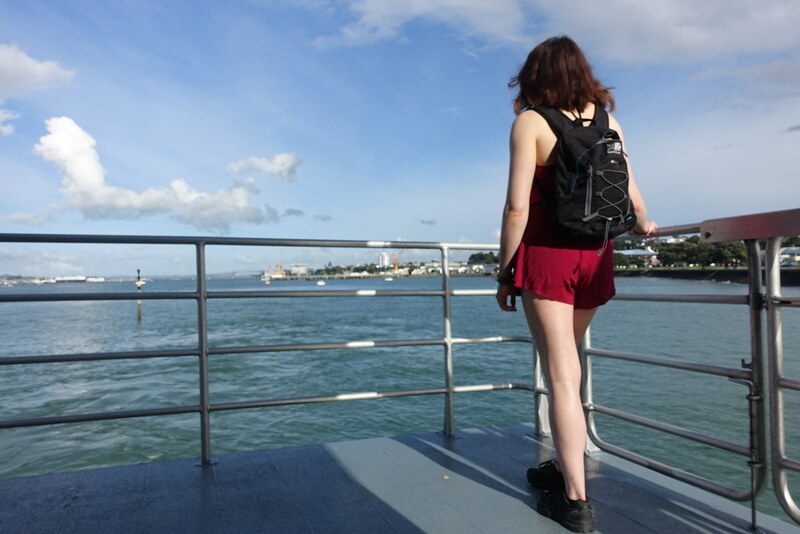 The harnesses include a pocket that fits a small water bottle or a phone, but everything else on you needs to go in a locker. The weather was hot and sunny for the first two lines, but just as we reached the third it started raining heavily. 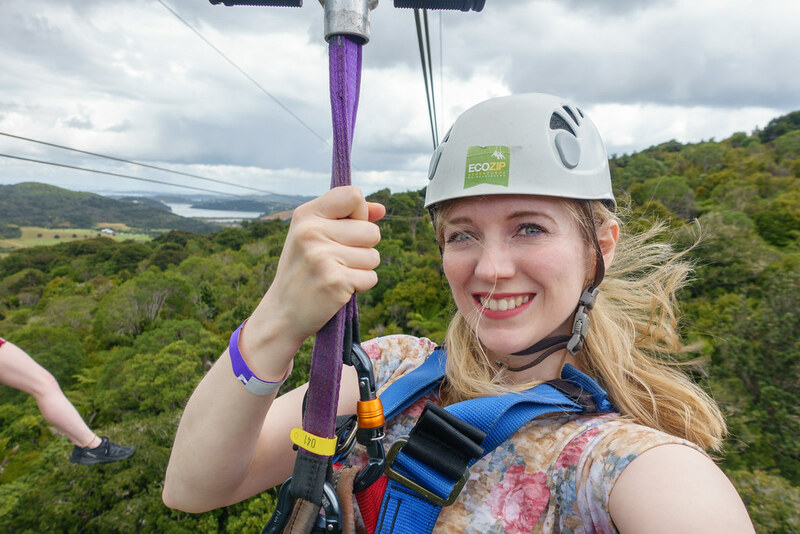 Fortunately, the torrential rain didn’t ruin it – it just made the third zipline feel like the end of a log flume, where you get soaked! The storm passed as quickly as it arrived, and we soon dried off in the sun’s heat. 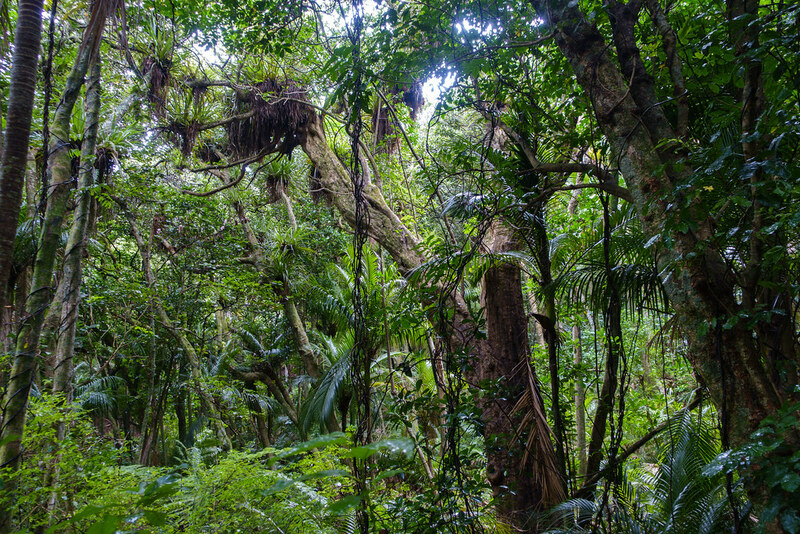 After the third zipline we were taken on a short guided walk through the rainforest back to the Ecozip headquarters. Our guide stopped frequently to tell us about the plants, trees and birds we passed, and his enthusiasm was infectious. Back at the office we took more photos in front of the spectacular view before getting back in the minibus. 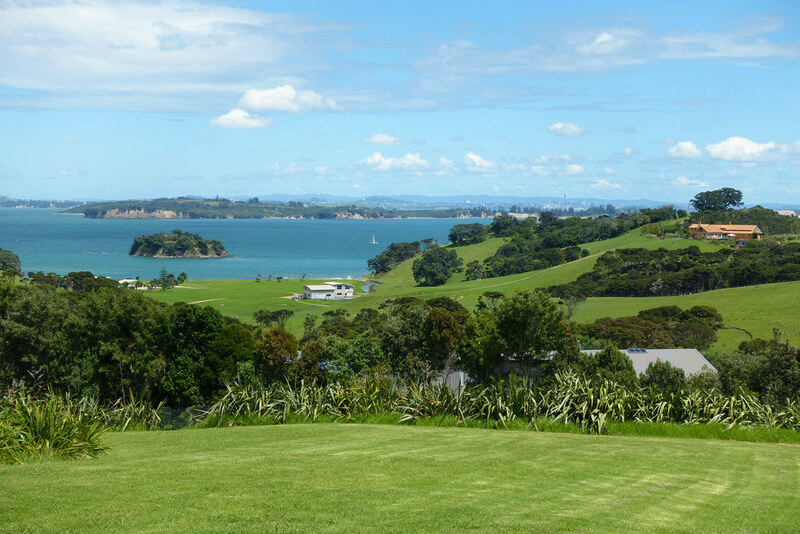 We could request to be dropped off anywhere we liked so we decided to get off at Cable Bay vineyard with three other travellers we’d met: Jess, Bryan and Chloe. They’d had the foresight to bring packed lunches, and they ate these on the grassy hill behind the winery which offered yet another expansive, overwhelmingly green view. We took some photos here before going inside to seek out lunch for ourselves. 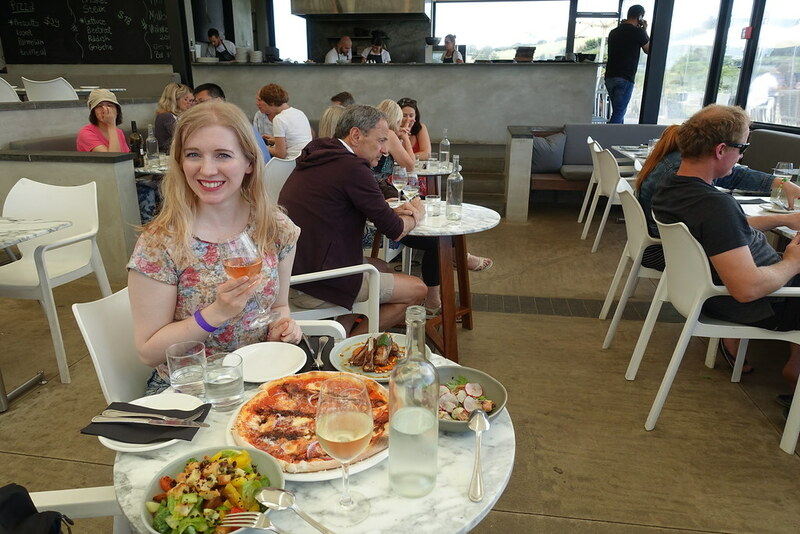 We decided to eat in Cable Bay’s elegant, glass-walled Verandah restaurant, which was actually more affordable than we’d expected. 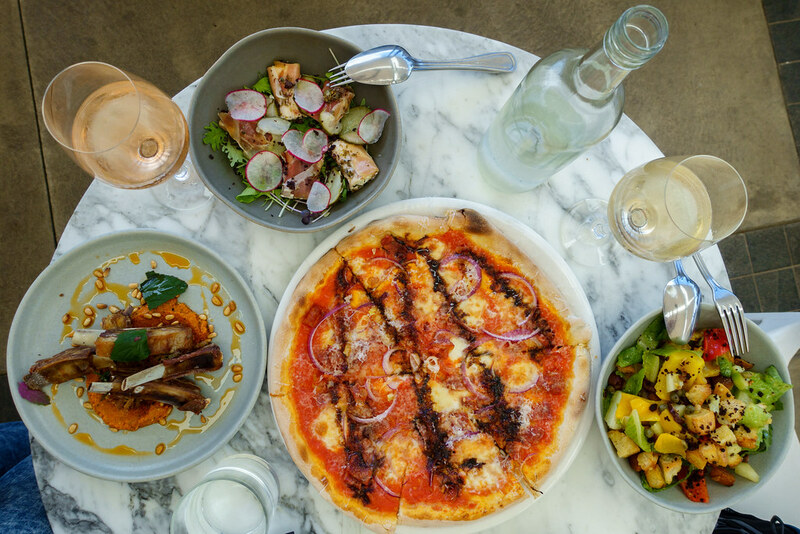 The menu is predominantly pizzas and sharing plates, and we couldn’t resist ordering a selection: an El Diablo pizza topped with chorizo, parmesan, red onions and balsamic vinegar; Taupo lamb ribs with romesco, pine nuts, za’atar and nigella; involtini prosciutto stuffed with goat’s cheese; and panzanella salad with summer vegetables, croutons and lime dressing. Everything arrived looking gorgeous and colourful, and tasting even better. Of course, we washed it all down with two large glasses of Cable Bay’s own wine. After lunch we headed to the ‘cellar door’ – a simple room with a bar and shelves full of bottles – for a ‘cellar door wine tasting’. 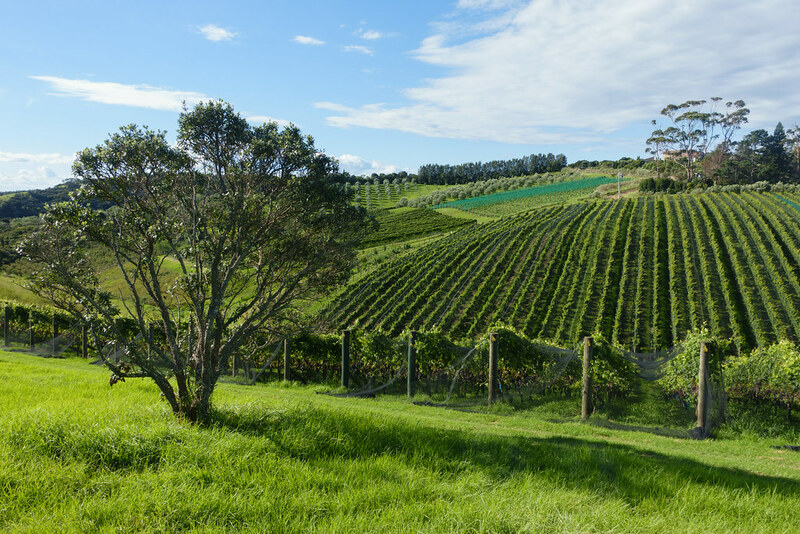 If you like wine this is a must-do, as it’s a fun and good-value way to try a range of wines made in New Zealand. 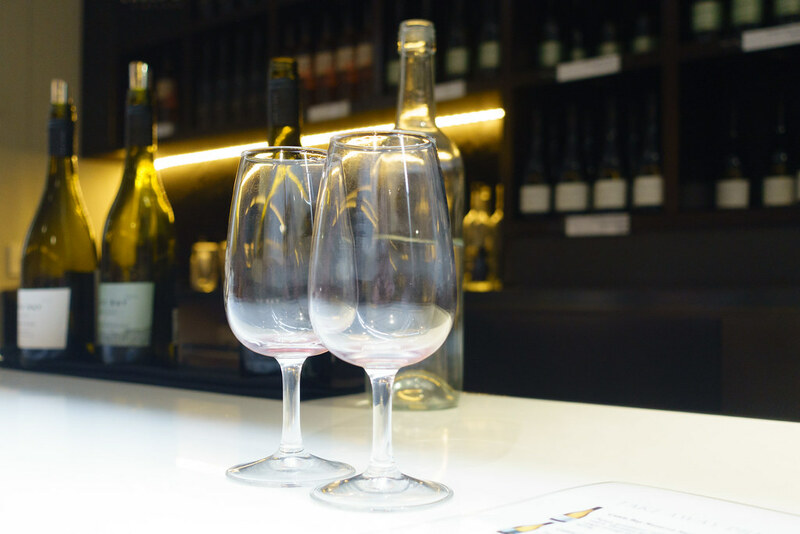 Just $10 gets you an on-the-spot, casual, guided tasting of four different wines. 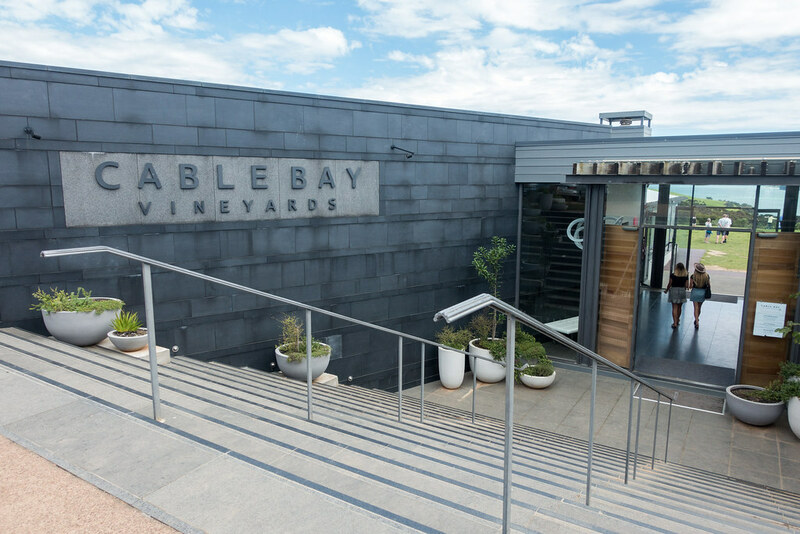 We really enjoyed the one we did at Cable Bay, where the female sommelier talked Tama and I through two reds (Pinot Noir and Syrah) and two whites (Reserve Sauvignon Blanc and Pinot Gris), with decent measures and absolutely zero pressure to buy. 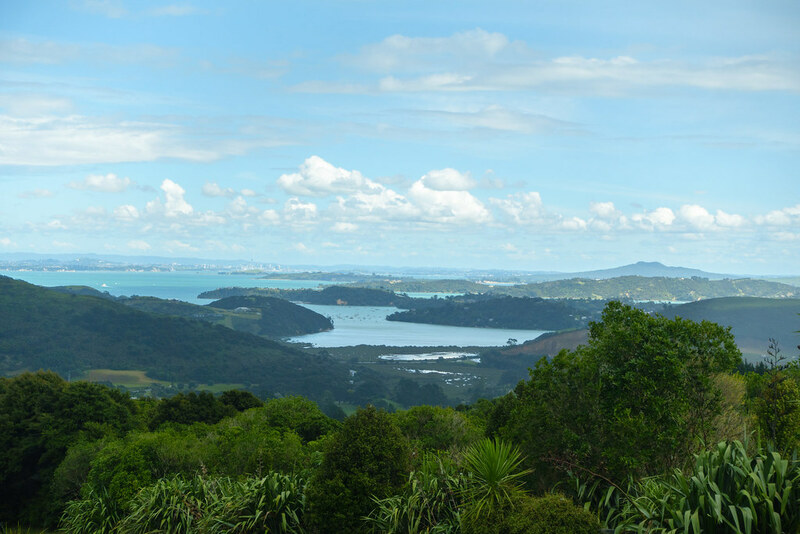 They were all made in Marlborough apart from the Syrah, which was made on Waiheke. 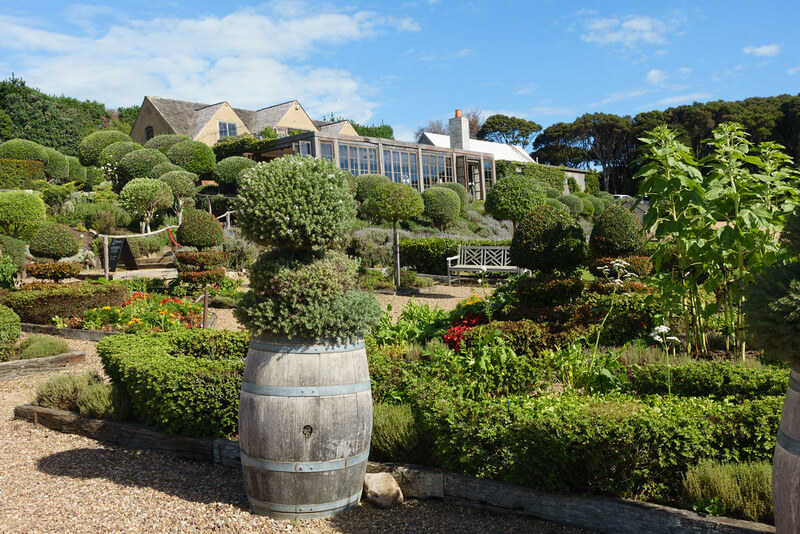 Next we walked 15 minutes down the road to Mudbrick vineyard, where we grabbed the most scenic outside table. 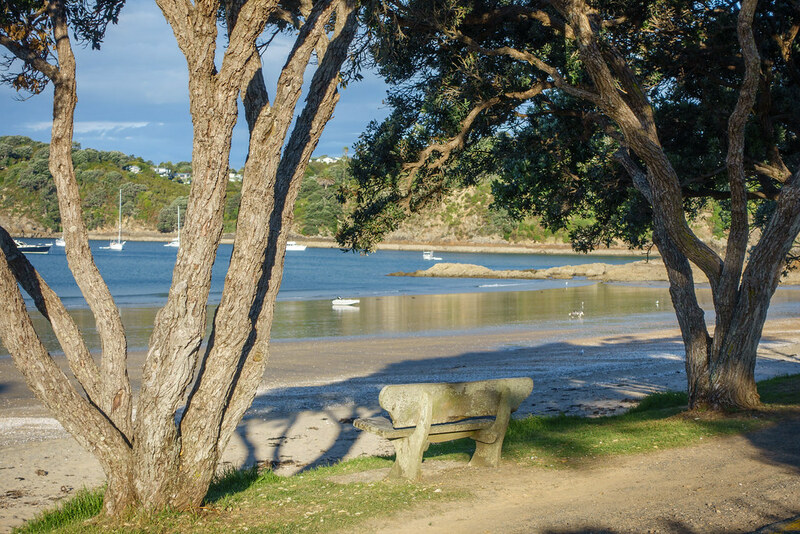 From our padded bench we were perfectly positioned to gaze down past the vineyard and over the verdant hills to the glistening blue water beyond. I ordered a large glass of juicy rosé, Tama (already wined out by this point) ordered a coffee and we shared two desserts: apricot tart with vanilla mascarpone, and chocolate parfait with blackberries, cookie crumbs and crème fraiche. 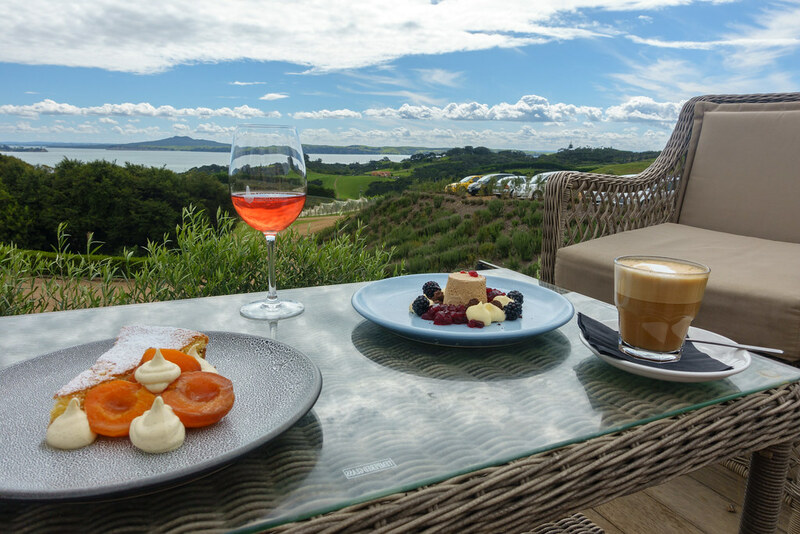 The food, the drinks, the view, the fresh air: we savoured it all, and it was glorious! 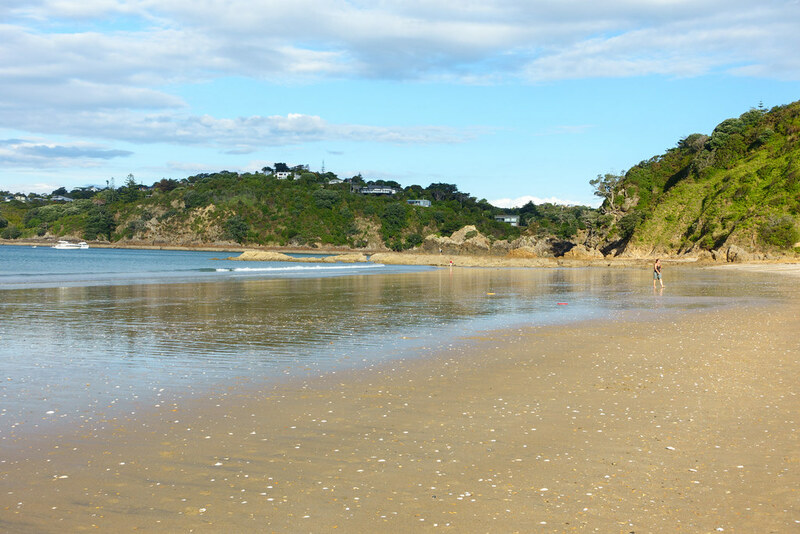 We ended the day at Oneroa Beach, which again was just a short walk away (although it would have been more efficient to start at Mudbrick, then stop at Cable Bay on the way to Oneroa). The beach was wide, windswept, and almost completely empty. 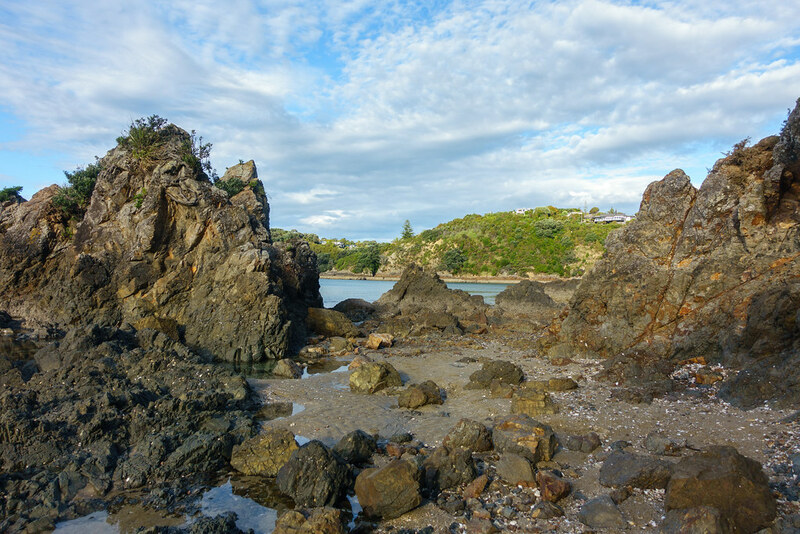 I walked to the far eastern end and crossed some rocks to reach the private cove of Little Oneroa, which abounded with shells, jagged rock formations, and rock pools buzzing with life. 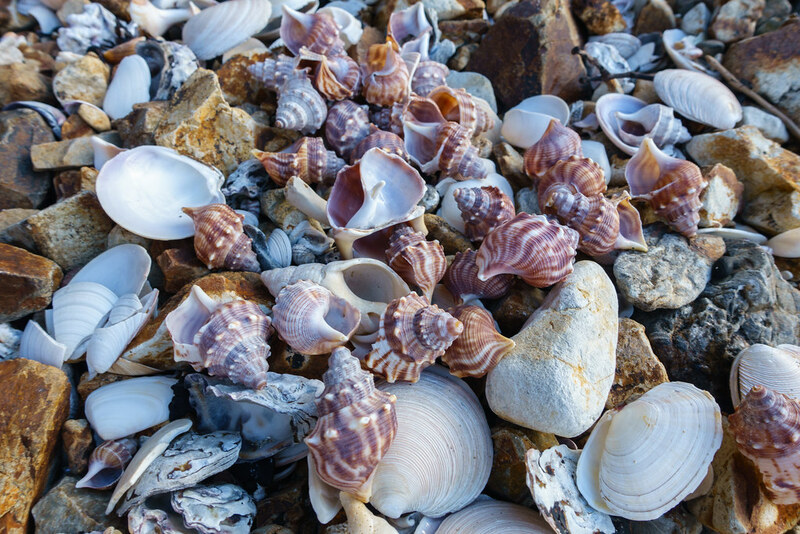 I hunted around for the prettiest pink conch shells before heading back to join Tama, where we sat on the sand enjoying the sound of the waves for a while. Before getting the bus back to the ferry port, we went into a shop along the road to buy water and snacks for the journey. 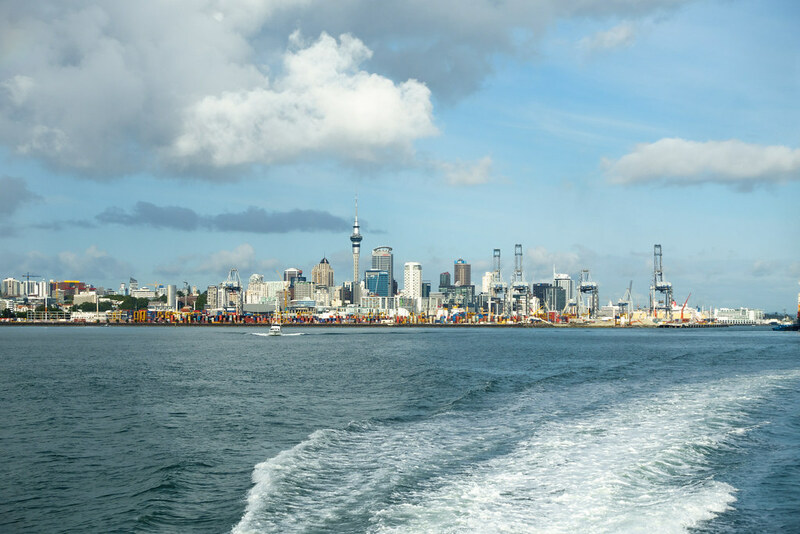 Tama was drawn to a bag of strange-sounding sweets called ‘pineapple lumps’, which a man at the bus stop told us was “a very Kiwi sweet!” We caught the bus, then the smaller 19.30 ferry back to Auckland, before settling in for an early night. 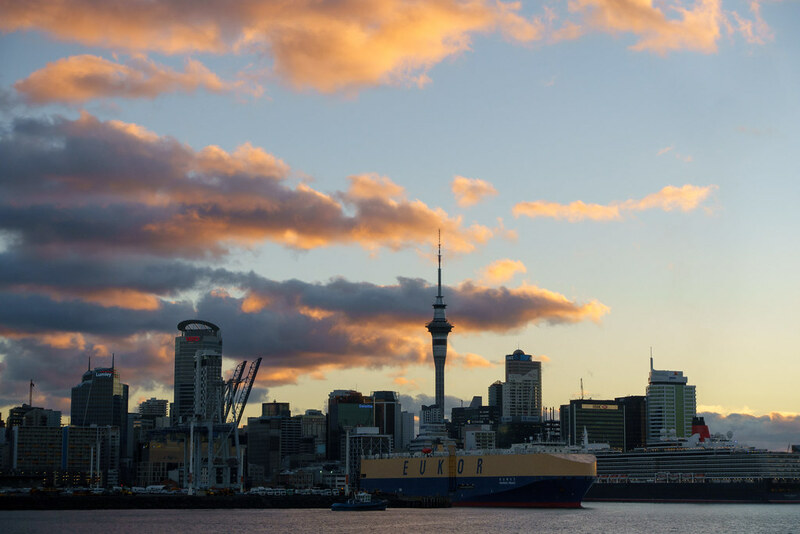 It had been an amazing first full day in New Zealand, and the start of even greater things to come. Tomorrow we had a 6am start to travel to Rotorua, via the glow-worm caves of Waitomo. 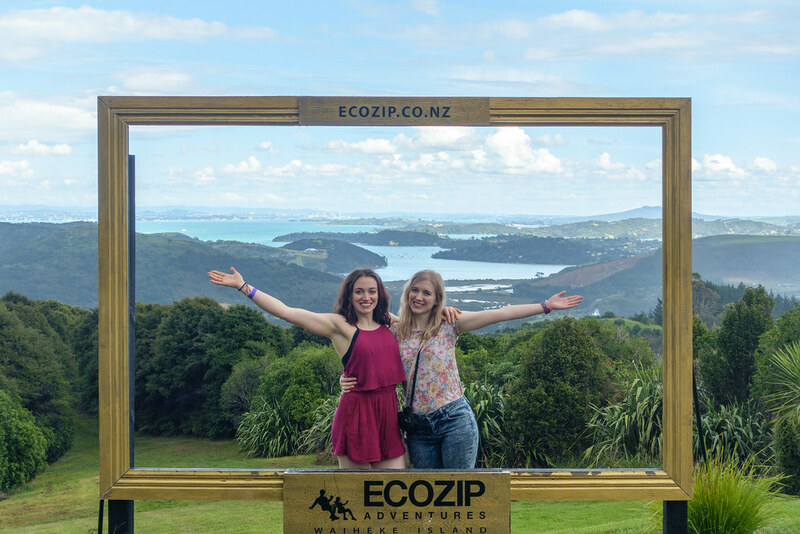 Posted in New Zealand, Photography, TravelTagged ecozip, mudbrick, Waiheke island, wine tasting, ziplineBookmark the permalink. That island sounds perfect. So many good things to see and do.